This story was passed on to Lloyd “Allie” Westcott by his grandmother, Mrs. Charles (or John) Fisher. The recorder was Roy H. Steffens, a local historian operating largely in the 1960s and 1970s, known especially for his interest in Civil War and Spanish American War soldiers and grave sites. 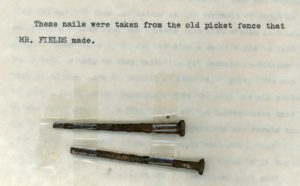 A manuscript copy of this story was found among Steffens’ papers in the Local History Collection at Traverse Area District Library. 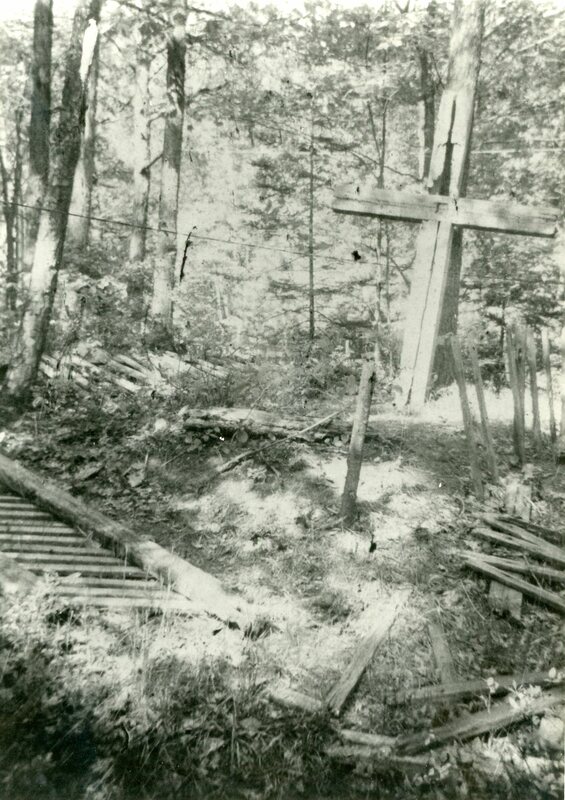 Steffens and Westcott restored the cross and fence described later in this story, in 1968. “Summer in Northern Michigan,” by teh Grand Rapids & Indiana Railroad Company, image courtesy of the Library of Congress. The lake was fairly calm that day and a couple men from the settlement of Glen Arbor were down by the lake when they noticed this small rowboat with a white sheet for a makeshift sail not far out from the shore. Word got back to the settlement of this boat with two people aboard. In a short time most of the people from the settlement gathered at the beach to welcome some strangers or newcomers to their settlement. It was discovered that there was two people aboard the small boat, a man and a woman. There seemed to be some reluctance on the part of the couple aboard the boat to communicate with the people on shore or land their boat, not knowing where they were or if the people were friendly. It was known by the couple in the boat that there was animosity among the people on mainland and those that were from King Strang’s cult. However in due time thru conversation the barrier of fear soon was overcome and the boat landed. The couple made themselves known as Mr. and Mrs. Fields and they had come from Beaver Island. They had explained they escaped from the island in the darkness of night as they wanted to get away from the tyranny that King Strand held over his people. They asked that they may stay a short while to rest up from their tedious trip as they wanted to get passage on steamer (propeller) that plied the Lakes to Chicago or some other port. The men helped to unload their meager belongings from the boat and all proceeded to the settlement. The Fields knew of the consequences they might suffer from the hands of King Strang’s ruthless men should they be found. It was decided to push the empty boat out in the lake to drift so if found it might be presumed that those in it had drowned or met with some other misfortune. 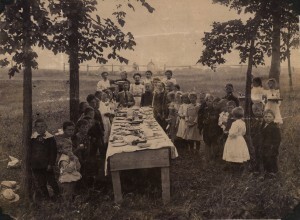 After unloading the boat all the people along with Mr. and Mrs. Fields proceeded up to the settlement. The local people realizing their plight vowed they would not reveal their names, their whereabouts or that they had been there. A John Dorsey that had a sailboat he used to bring in supplies from Frankfort agreed that when the Fields were ready he would take them to South Manitou Island where they might get passage on a steamer that would stop there. South Manitou was a port of call for the steamers to load up with cord wood which was used for fuel. 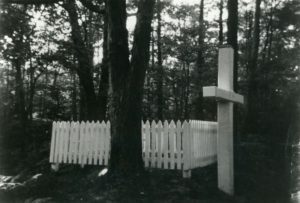 Fields’ original cross and fence, in 1968. Image courtesy of Roy Steffens. It was imminent that Mrs. Fields was about to give birth to a child and her time would be shortcoming. The women of the settlement prevailed up on them that they should stay with them until after the child was born. In a short time her time came and she gave birth to twins. Sadly enough though she should die from childbirth as well as the two babies. Mr. Fields secured some lumber and constructed a coffin in which was placed his wife with a child in each arm. A grave was dug on the small hill in which the coffin was placed. The people of the settlement all gathered for this sad event and she was given a Christian burial. 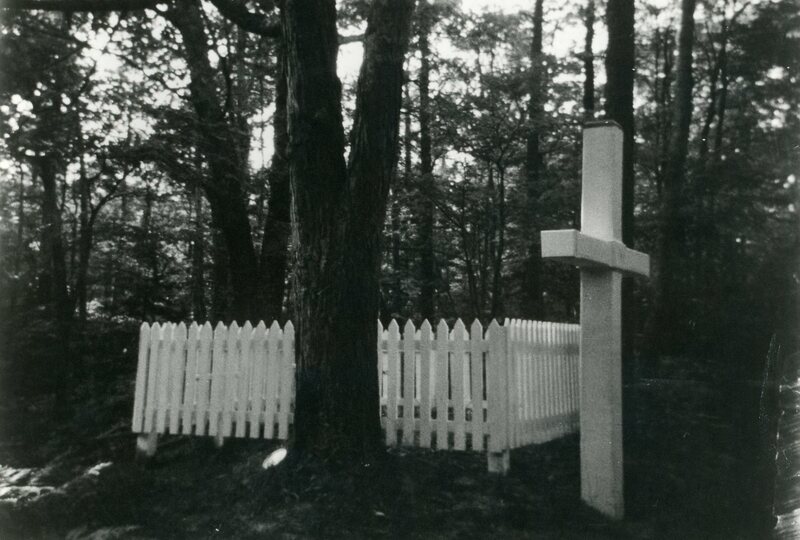 Restored cross and fence, by Westcott and Steffens, 1968. Image courtesy of Roy Steffens. 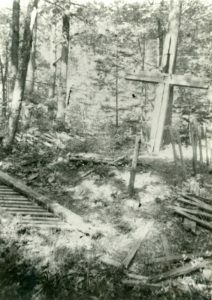 Mr. Fields constructed a large wooden cross out of cedar which he placed on the hill. The large cross thru time had weathered badly and became broken. 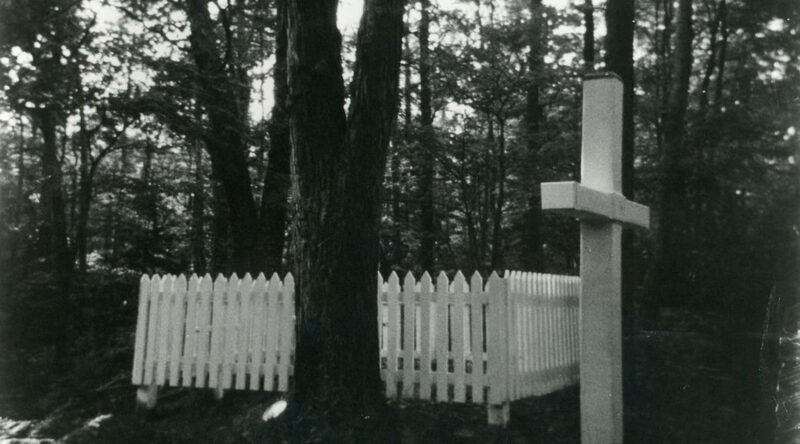 He also made a picket fence to surround the grave which weathered away due to time. A not of interest is that the picket fence was put together with iron cut nails. Also he placed at the head of the grave a smaller beautifully carved cross. After completing his work Mr. Fields sought passage on a steamer to leave and never returned as far as anyone knows. Iron-cut nails removed from the original fence around the Fields’ grave. Text and nails courtesy of Roy Steffens. The grave marker and picket fence described in this tale are found in Fisher Cemetery, Glen Arbor, Michigan. As James Strang ruled on Beaver Island from late 1850 until his murder in 1856, for this story to have any veracity, it must have taken place during these years, dating the graves of Mrs. Fields and her children to about the same time. This very dramatic story is widely known and repeated, but little corroborating evidence has ever come to light. Richard Fidler, editor of Grand Traverse Journal, published this piece way back in November 2015, concerning the Strang murder. This month’s “News from the Societies” features our wonderful neighbor to the north, Leelanau County! Whether you’re looking for a fun exhibit for all ages, or you’re looking to do some hands-on history conservation, June in the “LC” is where it’s at! Special thanks to Stef Staley, Director of Grand Traverse Lighthouse, and Kim Kelderhouse of Port Oneida Community Alliance, for keeping us informed through their newsletters and Facebook pages. You, dear reader, can also stay informed directly at their respective online presences, linked below for your pleasure. Also, join the newly re-named Traverse Area Historical Society at their first summer picnic! See below for details. Image courtesy of Grand Traverse Lighthouse. The Lake Michigan Aircraft Carrier Exhibit has been wildly popular for the Grand Traverse Lighthouse, and if you haven’t seen it yet, you are seriously overdue! But, lucky you, the Lighthouse plans to continue the exhibit for the 2016 season (“with key additions,” teases their website). The exhibit features the history of the USS Sable (IX-81) and USS Wolverine (IX-64). 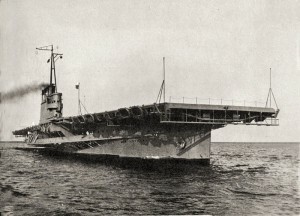 Both were converted to freshwater training aircraft carriers, used on the Great Lakes between 1943 and 1945. 20,000 pilots and landing signal officers were qualified on those vessels. There are awesome stories, sweet replicas, and whole myriad of photographs and histories to look at. Don’t wait, get on up there in June! 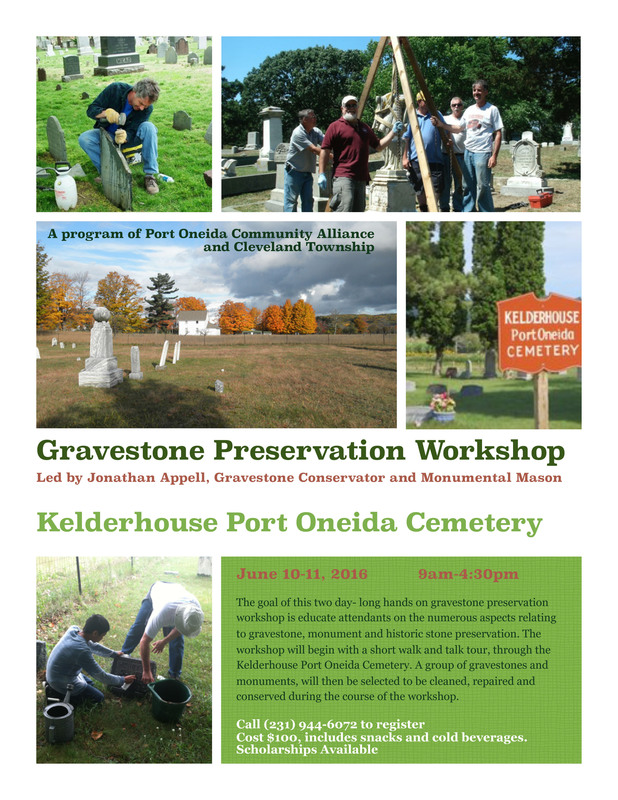 For hands-on fun, look to the Gravestone Preservation Workshop, hosted by the Port Oneida Community Alliance, in partnership with Cleveland Township, Leelanau County. A number of local cemeteries could use a little help in preserving their headstones, so consider getting trained at this event, and Your Editors will be glad to point you where your expertise is needed! 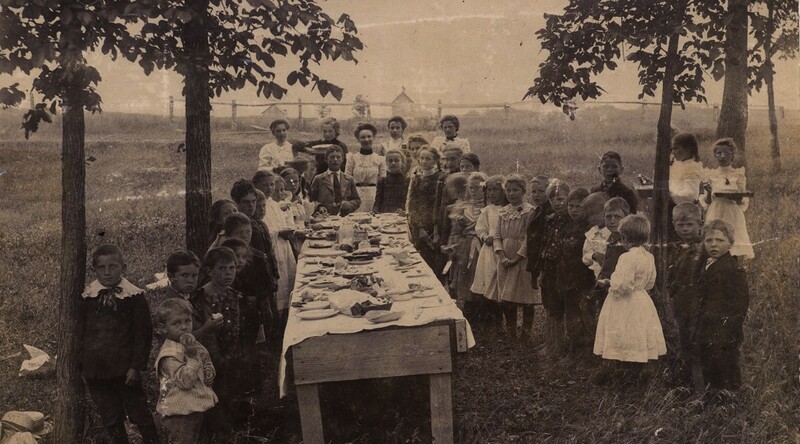 Join the Traverse Area Historical Society at our first social picnic of the year, at the Civic Center Pavilion on Sunday, June 26, 2016, from 12-4p. The Society is hosting this favorite event of years past, to bring their members together and reminisce about the simpler times. Your presence will make the picnic a success! Please bring your stories and a dish to pass! Place settings and beverages provided.